One hundred fifty five days to go before the 2010 presidential elections here in our country, the Philippines. And guess what?! I am still undecided whom to vote for since the day Senator Chiz Escudero backed out from his decision to run for the presidential race. Anyway, since I have time to decide whom to vote for, I opted to look for avenues to learn more about the presidential candidates. Unfortunately, most avenues are debates aired on TV in which I am not really fond off. So I looked for an online avenue where I can get more information about them that will help me decide for the upcoming elections, an avenue where I can learn about their agendas, goals and projects to make a better Philippines. And thank God I found PoliticalArena.com! 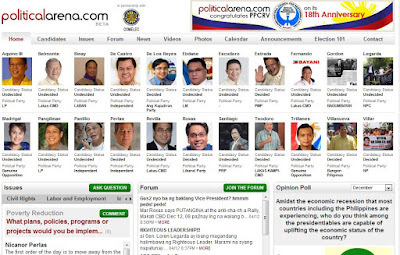 PoliticalArena.com is Philippines’ first socio-political networking site that is aimed to help promote voter education, discuss political issues and have an up close and personal discussion with presidential candidates. The site also supplies relative information on all political candidates vying for the presidential and vice presidency seats. They also have a political forum where you can discuss with other Filipino voters on major issues. After discovering the site, I immediately signed up and registered. I even participated in some discussions at the forum expressing my own opinion on some ongoing issues of our country. Check out my post here at “Who would you like, someone “capable” or “trustworthy”?” I also explored the pages of each candidate. Each candidate has their profiles, videos, pictures, blog and news. There is also a green button at the upper side of each page that says “I SUPPORT YOU.” When you click it, your profile avatar will appear at the candidates’ supporters. And if you decide not to support the candidate anymore, you can click the once green button now turned red and saying “WITHDRAW SUPPORT.” The site is amazing as you yourself can post videos and blog posts of your own opinion through your profile. It also has a stream of candidates supported and questions asked. Truly, PoliticalArena.com can really help in many ways in choosing the right candidate to vote this coming 2010 presidential elections and maybe a few days from now I will be finally posting the candidate I am going to vote for. By the way, PolitcalArena.com is made possible through the partnership of COMELEC, PPCRV and Youth Vote Philippines. The site operates under the network of 88DB.com, the Philippines’ first rich media service portal. walang itulak kabigin sa mga kandito, puro tadjak ang gusto kong gawin, lol! I have a Christmas Tag for you.